It’s been two weeks since that night when Pope Francis stepped onto the balcony in Saint Peter’s Square with all the crowds cheering. Much has happened in the meantime, including Pope Francis’ decision today not to live in the Papal apartments, but I’d like to take you back to the night of March 13th and tell you the story from my point of view – my view from the cobblestones. Boy were they wet that Tuesday! I wrote this as it came to mind, and it ended up quite long, so don’t feel obliged to read it. No hard feelings if you press delete! But whatever you do, please say a prayer for Pope Francis. Right now I’m sure he’s faced with many tough and important decisions, and he needs our support through and through. If you do decide to read on, I hope you enjoy it! I sat at my desk, trying to make the theology stick in my head. It was no use. The Cardinals had been locked all day in the Sistine Chapel trying to elect a Pope, and I was dying to know what was happening. I had been in Saint Peter’s Square the day before to watch the smoke the first night of the Conclave, but as expected, it was black. When I had asked Father about going the next few days, he told me I could only go once. “Today or tomorrow…? Today or tomorrow… ? – the question surged through my head. “Ok, I’ve made my decision.” I looked at my watch: 4:45pm. There was no way I’d make it to the train station before 4:50, unless I took the shortcut. I stuffed some Girl Scout cookies in my bag and ran down the back driveway of our house. There at the bottom is a 12-foot gate, and I climbed over it like many times before. It was raining cats and dogs as we got out of the train at Saint Peter’s station. Even worse, the guards had decided to turn on the metal detectors for everyone entering Saint Peter’s Square. Usually the detectors don’t go off for me, but this time no matter what I took off the thing beeped. – belt, shoes, jacket – heck, I was willing to go in my swimming trunks, but finally the guard let me through. 5:10pm. If the 4th ballot had produced a Pope, it should come out white just about now. My friends and I – one from Kentucky, one from Illinois, and one from France, stationed ourselves in line of sight of the famous chimney, and relatively close to the front of the square. Umbrellas up, we formed a small cluster complete with roof. By 6:00pm, there was no smoke, and we assumed the vote must have been a dud. 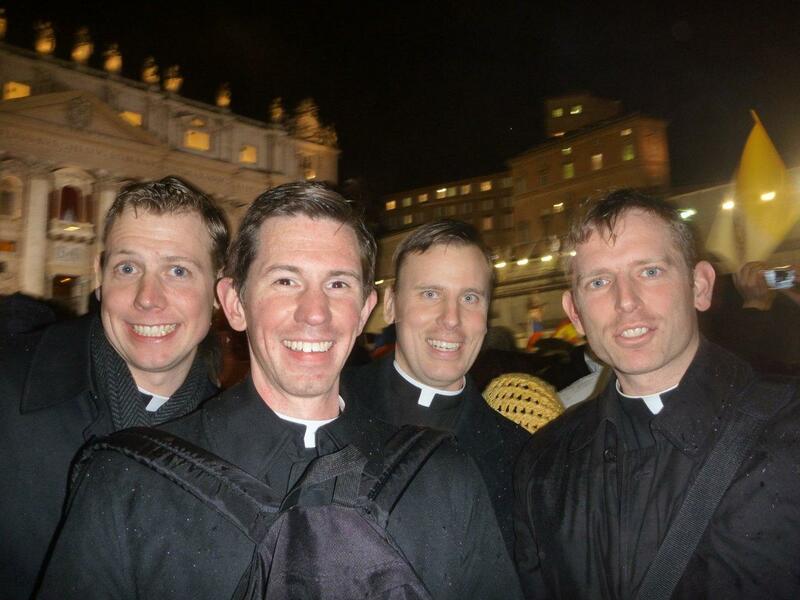 Some of the other guys who had come on the train with me started heading back to the seminary – what for I didn’t know. At about 6:30, a seagull landed directly on top of the chimney, and the crowd cheered. By now the square seemed like an interminable sea of umbrellas. It had been raining almost non-stop the last four days, and now the rain just seemed like any other part of the landscape. I had brought the Girl Scout cookies to celebrate my friend’s birthday, but they weren’t going to be enough for the four of us. So me and the guy from France headed over to the Vatican grocery store to buy some more cookies. We had 3 euros. Inside the grocery store, everyone was talking about the conclave. We grabbed three bags of cookies and headed to the checkout. There two Italian guys regaled us with their passionate choice for “Santo Padre” – Cardinal Sean O’Malley of Boston. O’Malley is a Franciscan, and in many ways Italy is a Franciscan country. These guys weren’t the first Italians who had talked to me about O’Malley, and just that morning I had read the prediction in one of the biggest Italian newspapers – O’Malley was the man anointed to be Pope. “Gosh, they really love their Franciscans,” I thought. We sang happy birthday to Brother David and dug into the cookies in his honor. We don’t get that many American-style cookies in Rome, so we had bought – you guessed it – chocolate chip cookies – all that 3 euros can buy. Within 10 minutes the cookies were gone, but they had left us in a pretty good mood. We talked about who we thought would be Pope – all the names that everybody had thrown around the last few weeks – Ouellet of Canada, Sandri of Argentina, Dolan and O’Malley of the US, Scherer of Brazil, Schola of Italy, perhaps the cardinals would even force Benedict to come out of retirement! Personally, I was hoping it would be Bertello of Italy, if for no other reason than to be able to boast that once I fixed the Pope’s treadmill! By now two more seminarian-friends had joined us – one from Mexico and one from Vietnam. Brother David had us all agree to just expect black smoke – that way we wouldn’t be disappointed no matter what happened. Seven o’clock came, the rain stopped completely, and still there was no smoke. “The later it is, the more there’s a chance we have a Pope,” said my French friend. We watched and waited. “Watched” in the relative sense, because unless you have some impossible capability to concentrate, you can’t keep your eyes continually glued to a chimney stack 400 feet away for 2 hours. The night before, the black smoke had started out kind of weak and grey, and then turned into a thick black sinking plume of smoke. I expected to see the same thing. As the minutes ticked past: 7:01, 7:03, 7:05, the crowd got rowdier. People started shouting for nothing, and cheering. Then at 7:06, a little wispy something drifted out of the chimney. It looked just like the beginning of the black smoke the night before. The whole square – thousands of people – gasped. The next second, I expected the heavy black smoke to pour out just like the night before. But it didn’t. “It’s white!! !” I shouted. Sure enough, the little wispy something grew, and there was nothing black about it. The square exploded. Literally. I include a video to let you feel a little bit what it was like. Ecstatic, elated, euphoric – they’re all understatements. People started jumping up and down and hugging eachother. At the same time, the crowd surged forward, pulling us with it. My poor French friend was stuck with the French Canadian news station, but he soon caught up with us. “We have a Pope!” everyone was shouting in more languages than I knew. “It just feels good to know we have a Pope –even if we don’t know who he is,” said one of my friends. The crowds started chanting “Viva il Papa, Viva il Papa” on and off. He had been Pope for less than half an hour, and they didn’t know who he was, but they were already cheering him on. “Annuntio vobis gaudium magnum, habemus papam” Cheers. “Eminentissimum, ac reverendissimum, dominum, dominum Georgium Marium,” with the announcement of the first name of the new Pope, people started calculating in their heads who it could be. I had checked a list before and remembered that there were something like 4 Georges, but what about the “Mario”? “Sanctae Romanae Ecclesiae, Bergoglio”, a few people cheered immediately, but most of us were thinking “who is Cardinal Bergoglioi?” I remembered reading an article by John Allen Jr. that had mentioned Bergoglio – a favorite in the last conclave, but now in his seventies, I had thought him too old to be elected. From Argentina, right? And a Jesuit? No way!!! “Why would the cardinals choose someone in his late seventies?” I thought. “Qui sibi nomen imposuit, Franciscum” Now the crowd really erupted. “Franciscum – Francis!! !” “Wow!” What a name! It was the first new name for a pope in over a millennium! And I quickly understood why the Cardinals had chosen this man from Argentina to fill the shoes of the fisherman. I just knew he chose to be called Francis after Saint Francis of Assisi, probably the greatest single Christian witness of all time, someone who loved God totally and lived the Gospel radically. As the cardinal walked away, the whole square stopped cheering and started chatting. “Who’s Bergoglio?” “What does Franciscum mean?” “Where’s he from?” “How old is he?” I answered the same questions over and over. I found out later that BBC had prepared a half-hour video about each of the top 15 cardinals who could be pope. They had spent hundreds of thousands of dollars doing interviews all over the world. Cardinal Bergoglio was not on their list. Five workers walked out onto the balcony and quickly hung a huge white and red tapestry over the front of the balcony. It took them all of twenty seconds or so, and by the time they disappeared, the crowd had already digested what they had just heard, and started clapping and chanting “Francesco, Francesco!” They knew the new Pope could hear them. The crowd before me was a sea of cameras and ipads all focused on that one balcony. A lone Argentinian flag waved in the middle of them all. I was glad the other flags were down now, because it made for easier viewing. “If the new Pope is from your country, you can wave your flag all you want,” I thought. Before long, the side balconies filled up with Cardinals in red. The people started yelling louder and louder until the moment when the red curtains on the central balcony were wrenched apart. First came a cross, and then right behind, a man dressed in white. We had all been expecting a man dressed in red and white, but this was ok. He waved, a simple, very shy one-handed wave. The crowd screamed, and then started into their chant again: “Viva il Papa, viva il Papa!” As we chanted, the new Pope stared out at us, and honestly, it was then that I fully understood the meaning of the term “Like a deer in the headlights.” He just stared and stared, I think kind of in shock from it all. He stayed like that for about two minutes, saying nothing, not moving, as we chanted. He wasn’t even smiling much – “What have I gotten myself into?” seemed to be what he was thinking. Eventually they brought him a microphone, and he started to speak. “Fratelli e sorelli” – “Brothers and sisters” before he could continue, the people started cheering again, but he managed to get a “Good evening,” in before they broke out screaming again. “You know that the duty of the Conclave was to give a bishop to Rome. It seems as though my brother cardinals went to get him almost to the end of the world.” Cheers and laughter. “I thank you for your welcome. The diocesan community of Rome has a bishop. Thank you! And before anything else, I’d like to say a prayer for our Bishop Emeritus, Benedict.” Huge cheers and clapping. [which has been the same every time anyone has mentioned Benedict’s name – people go crazy] “Let’s pray all together for him so that the Lord bless him and so that the Madonna takes care of him.” Cheers, cut short by the Holy Father leading us in the Our Father, Hail Mary, and Glory be. I honestly think that with all the people there in the square and all the people listening by radio and all the people watching, this must have been the moment in history where the most people ever have prayed together like that. “And now, we begin this path, Bishop and people. This path of the Church of Rome which is the one that presides in charity over the churches. A journey of brotherhood, of love, of trust among us. Let us always pray for each other. Let’s pray for the whole world, that there be a great brotherhood. I hope that this path of the Church which we begin today, and in which my Cardinal Vicar who is present here will assist me, will be fruitful for the evangelization of this very beautiful city.” Cheers. The Pope obviously recognizes that many of the people in the square who’ve come to see him are Romans, and that they too can’t be forgotten. “ And now I would like to give my blessing. But first I’d like to ask you a favor. Before the Bishop blesses the people, I ask that you pray to the Lord that he blesses me – the prayer of the people asking blessing for their bishop.” Clapping and cheers. This is something new – no Pope has ever asked his people to pray for him like this. From behind, someone yells out “Viva il Papa!” but the Pope continues. “ Let’s do in silence this prayer of you over me.” And then he bowed his head low before all of us. Utter silence. 20 seconds of it. The people all took him seriously. And I think this was a courageous but important thing to do. Of course the Pope always has people praying for him, but to ask us for special prayers in that solemn moment showed us that he knew the gravity of the task before him, and it taught us the lesson that yes, our humble prayers are essential for a great man like the Pope. Then a cardinal comes out and explains that the blessing the Holy Father is about to give us brings with it a plenary indulgence, and this counts not only for us here in the square, but for everyone who listens to or watches him give it. The blessing was all in Latin, and Pope Francis read from this huge old illuminated manuscript. The crowd explodes again. “Viva il Papa, viva il Papa!!! Francesco!!! Francesco!! !” the Pope just stands there watching us. The two marching bands below start to play there famous tunes. What’s that, the Italian national anthem? The Pope turns around and asks for the microphone again. “Brothers and Sisters, I leave you. Thank you so much for your welcome. Pray for me. And we’ll see each other soon. Tomorrow I want to go pray to Our Lady so that she takes care of all of Rome. Good night and sleep well! With that the Pope turns, and quickly disappears. The crowds shout one more time, then the bells start pealing. Before I know it I’m being swept away with the crowd out of Saint Peter’s and into the streets of Rome. We had been standing there in the rain eating our cookies while inside the Sistine Chapel this fateful drama played out and Pope Francis was elected. And it’s just the beginning. These last two weeks we’ve been watching Pope Francis in action, and it’s a good idea for us to keep our eyes on him. I’ve been reading a book-length interview done with him three years ago called “El Jesuita” The Jesuit, and it’s been eye-opening, if not for anything else than that it has shown me that Francis is a person who deeply understands the problems and sorrows of men and women today, and who, even if he admits he doesn’t have all the answers, has a solidly Gospel-based vision for the future. I’m happy to have him as shepherd, and excited to be in the final stretch before my ordination with him at the helm of the Church. May God bless him, and bless you all!